I’m taking advantage of the Backwardation in Oil. 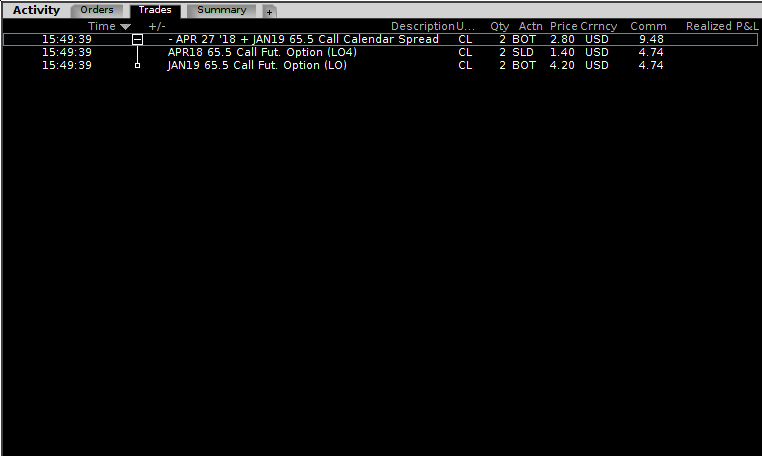 So I’ve bought 2 CL Apr 27 – Jan 19 65.5 Call Calendar Spreads for $2.80 which means that I bought 2 CL Call Options with a Strike Price of 65.5 which will expire in January and sold 2 CL Call Options with a Strike Price of 65.5 which will expire in 10 days. I will keep the one that expires in January and rollover the one that expires in 10 day. I guess I will let my SPY 265 Put expire worthless on Friday. Next Post:What to do if your FTP Client only shows 9998 Files.